Columbus Day is still an official federal holiday (we just looked it up). Most government offices are closed, although not in Columbus, Ohio. And, more telling, all the banks and post offices. And yet, the indigenous among us find this somewhat inappropriate. Columbus Day. Alcatraz on a day to celebrate a divided nation. We consider ourselves indigenous, having been born here. But we also consider ourselves fortunate our grandparents and great grandparents (depending on which side of family coat of arms you focus on) decided to emigrate here. When that was a politically correct option. So, you might say, we feel a bit divided. And consequently we feel the need for a holiday that celebrates the division in this country. And what better holiday than Columbus Day for that? On the one hand you have all us Italian-Americans cheering the bravado of a Genovese sailor who convinced the Spanish monarchy to fund his trip off the edge of the world. On the other, you have all these indigenous people who rightly complain that they didn't exactly invite anyone over. If we all sat down at a table together would it look like Thanksgiving? Or a high school cafeteria food fight? Lately it's been more like the later. Last week wasn't a food fight, though. People don't get hurt in food fights. Last week people got hurt. All of us, in fact. As an indigenous Italian-American, we think we all deserve better. Better than Mitch McConnell's hypocritical disgust with "delays." Better than Susan Collins' uninformed insistence on "corroboration" for a sexual assault. Better than Brett Kavanaugh's idea of candor, decorum and entitlement. Not to mention a president who has no business questioning anyone else's integrity. What we have in mind, frankly, is Ruth Bader Ginsburg. And we had her in mind all Saturday night when we used our public library's Hoopla media service to watch RGB. We were teary eyed at the scenes from her confirmation hearing in which she talked openly about the law, unafraid to educate the senators as she had once educated the justices of the Supreme Court that institutionalized gender discrimination (for men as well as women) wasn't fair to anyone and women's reproductive rights are essential to achieving gender equality. Detail. Showing flag at half mast. She also unmasked the "originalist" conceit. "We the People" literally did not include anyone but white landowners, many of whom "owned" slaves. And yet, today, that originalist understanding of the U.S. Constitution wouldn't fly over the Potomac. Ah, what we'd give for another straight shooter like RGB. 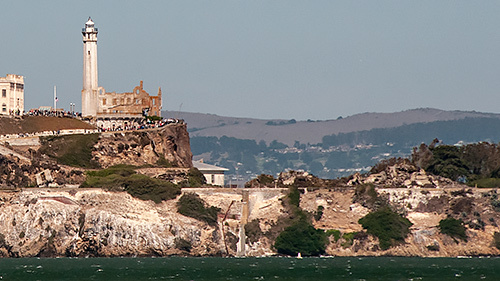 So on this holiday that isn't celebrated, that brings out the divisiveness in this country, we've illustrated this piece with an image of the former federal penitentiary Alcatraz, whose lighthouse beams next to a barely discernible flag at half mast. It may indeed seem like our flag is at half mast today, mourning the values we used to cherish as Americans. But values don't die. They are just betrayed. 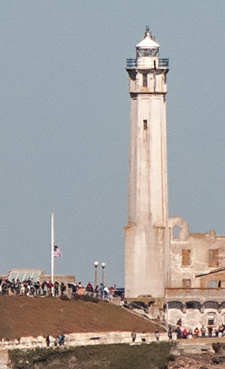 In contrast, that Alcatraz lighthouse still shines its bright beam from the former prison, even now. It's as if it is persistently showing the way for some intrepid adventurer seeking a better world just beyond their grasp. A world where those once-cherished values would be honored rather than betrayed. On this divisive holiday, let us celebrate as indigenous immigrants who hold these values sacred -- and expect as much of anyone who would represent us.